This pony saddle is every little pink loving cowgirls dream with pink crystals and comfortable pink seat with extra grip! 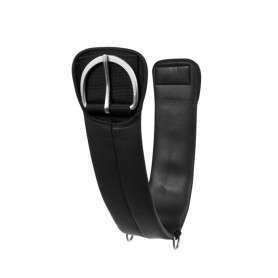 Comes complete with matching headstall, reins, and breast collar for only $179.99 for a limited time only! Was $349.99 Now $159.99 For A Limited Time Only! Your little rider will be looking pretty in pink in this adorable saddle! 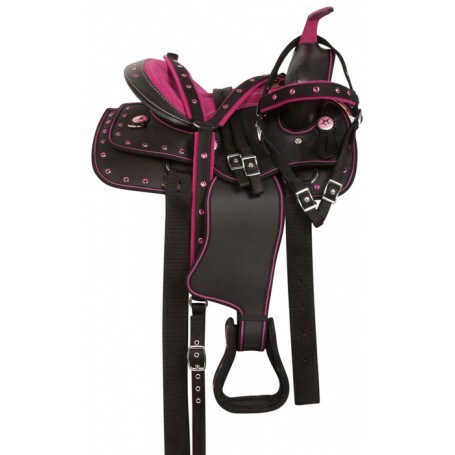 This saddle features fuchsia pink accents including crystal trim around the skirt edges and the cantle, a fuchsia padded seat, and nylon binding around the edges that help make the saddle tear proof. The silver Texas star conchos inlayed in pink make the saddle stand out. The underside is well padded with synthetic fleece for optimum pony comfort. For a limited time only, receive a FREE matching headstall, reins, breast collar, and saddle pad while supplies last! Cinches not included.